Martin Barr doubled up as he made a rare Ulster championship appearance. The Nutt Travel Ulster Adult Motocross Championship opener attracted one of the largest entries for many years with over 220 riders lining up to race at the NIMC meeting around the immaculate Robinson’s MX Park, Claudy. Ballyclare’s Martin Barr was the star of the show on Saturday winning both the premier MX2 classes on the YZ250f Crescent Yamaha and with both MX1 and MX2 classes combined the talented local rider was first across the line in both races. “That’s my first home race in a fair few years and I really enjoyed it. My main priority going in to it was to get more race time,” said Barr. “With my calendar the way it is there is still two weeks before my next British race at Lyng and for me to not race for that length of time with all the top competitors racing GPs week in week out would not be ideal. “It means that by the time Lyng comes round the race sharpness wouldn’t be there. I was really looking forward to Saturday and the club had the track in superb shape. The day started off well being fastest in MX2 then second in superpole,” he added. “Being out with the 450s meant I had to work my bike hard, which was good. “I made a decent start in race one and quickly made my way up into second and was on the pegs following James Mackrel for ten minutes or so before showing him the wheel a couple of times and then making my move. Reflecting on race two, Barr said he adapted a slightly different strategy. “In race two I didn’t want to muck about as the sun was so low and the track was sketchy in places so I took a different approach to the race,” said Barr. “I made a good start and got past the leading four on the opening lap to get into the lead straight away. When I hit the front I put in a couple of fast laps and as I could see where they were on the track I just kept the gap steady and brought it home for another win. “It was just nice to get behind the gate again and do some more racing. I feel sorry for the club though after they put so much effort in to get the place all sorted. Second overall in the MX2 class was Glenoe’s Glenn McCormick on the Unique Fit Out Husqvarna. McCormick showed that he was back on the pace that won him the Ulster title in 2018 with two strong races. ”I was happy with the results. My second race was much better than the first,” he said. Third overall was Jordan Keogh on his 250 Kawasaki. Fastest man in practice and Magilligan MX Park super pole winner, James Mackrel, was pleased with his days work, winning the opening MX1 race after a long battle with MX2 winner Martin Barr then taking second behind Jason Meara in race two. “It was not too bad and I’ll take away the positives. 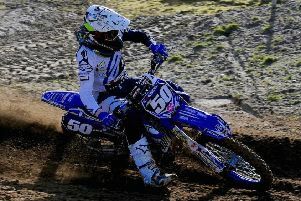 It was only my second race on the 450 G&G Ross/Russells Yamaha. With so little bike time on the 450 we struggled with the bike set up. “I didn’t think I could hold of Martin Barr off for so long in race one and because I used so much energy in race one I ran out of energy in race two. “I had no more to give. I had the fastest lap in race two so I was happy with that. “I just need more track time on the big bike as I concentrate a lot more on the 250 that I race in the British championships,” explained the 22-year-old Belfast rider. Loughbrickland’s Jason Meara, who moved into the MX1 class for 2019, put in two great performances on the Watt Motorcycles Kawasaki. Despite still recovering from a broken wrist he finished second in race one followed by a last corner victory over James Mackrel in race two at Claudy on Saturday. “I’m happy as I am still learning the bike. I was dead last in race one and worked my way to second then in race two I made a decent start but got held up for a couple of laps before closing on Mackrel,” he said. “I followed him for a couple of laps before squaring him off at the final corner and went up the inside to take the win. I don’t think he was expecting it. Reigning Champion Lisburn’s Richard Bird had a quiet day by his standards finishing third overall on the Five5 Motorsports Watt Motorcycles KTM. John Meara had a tough day on his Watt Motorcycles Kawasaki claiming fourth overall despite crashing on the opening lap of each of his races. “Everything that could have went wrong did,” he said. “In race one I was involved in a first corner pile up but if the race had been five minutes longer I would have caught Jason (Meara) and Richard (Bird). In the other classes it was Jack Daly who won the MX1 semi-experts while Connor Mullan took the MX2. The Clubmans MX1 winner was Stephen Mottram with Eoin Duffy the MX2 winner. Jonathan McBride was the veterans class winner. The organisers were unfortunate with a few spills over the day. Thankfully no one was seriously injured but it did mean that they ran out of time to complete the race programme.